Yes—Writing an RFP can be easy! Preparing an RFP for commercial cleaning services can feel like torture. You need to do one, because that’s what will make the process fair. They take so… Much… Time. And how can you be sure you’re not forgetting anything? That’s where our checklists can help. 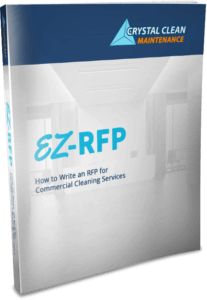 When you download EZ-RFP: How to Write an RFP for Commercial Cleaning Services, you’ll get a printable set of best practice checklists, as well as quick tips on how to prepare a great RFP. Get your RFP together more quickly and more efficiently—with EZ-RFP. Download your copy today. Just enter your email and click Request my EZ-RFP to receive your copy.